We’re very excited about the latest Silver Stage, Glastonbury Festival news. 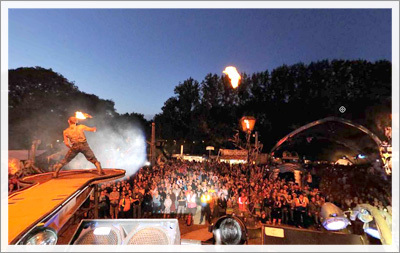 We have been booked to build an extra special installation at Glastonbury this year! We will be installing one of our unique, silver S5000 structures on top of a raised platform as a superb bar and viewing area in the tremendous Arcadia section of the festival. Arcadia was one of the highlights of last years festival, with entertainment carrying on well into the early hours. If last year was anything to go by, the new viewing area will be perfect for a bit of cheeky evening fun!